The Norway maple is characterized by flattened, disc-shaped seeds and the shoots and leaves containing milky sap. It is also frequently confused with the more distantly related Acer saccharum (sugar maple). The sugar maple is easy to identify by clear sap in the petiole (Norway maple has white sap). The tips of the points on Norway maple leaves reduce to a fine "hair", while the tips of the points on sugar maple leaves are, on close inspection, rounded. The roots of Norway maples grow very close to the ground surface, starving other plants of moisture. For example, lawn grass (and even weeds) will usually not grow well beneath a Norway maple, but English Ivy, with its minimal rooting needs, may thrive. In addition, the dense canopy of Norway maples can inhibit understory growth. Some have suggested Norway maples may also release chemicals to discourage undergrowth, although this is controversial. 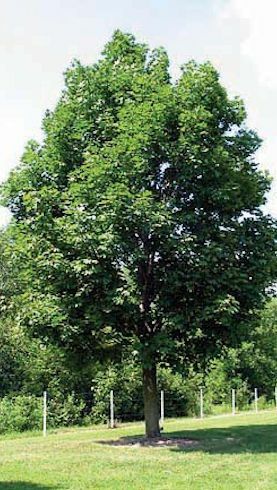 Norway maple has been shown to inhibit the growth of native saplings as a canopy tree or as a sapling. As a result of these characteristics, it is considered invasive in some states, and has been banned in New Hampshire and Massachusetts. The State of New York has classified it as an invasive plant species.